Echeveria (Echeveria): growing, planting, caring. 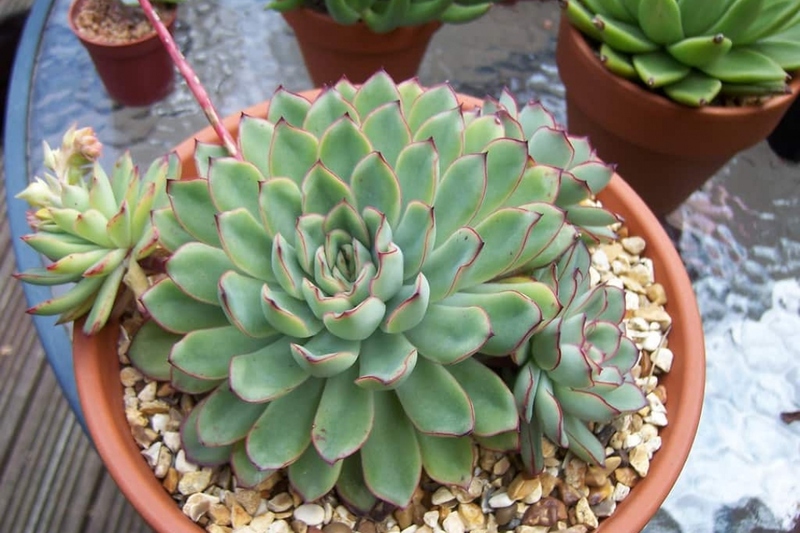 A succulent plant with decorative leaves, the echeveria is simple to grow, in dry pot. Echeveria may be evergreen or deciduous, and are popular as ornamental garden plants. Their flowers arise from compact rosettes of succulent fleshy, often brightly coloured leaves. They are drought-resistant, although they do better with regular deep watering and fertilizing. Most will tolerate shade and some frost, although hybrids tend to be less tolerant. Most lose their lower leaves in winter. As a result, after a few years, the plants lose their attractive, compact appearance and need to be re-rooted or propagated. In addition, if not removed, the shed leaves may decay, harboring fungus that can then infect the plant. Echeverias are dry, rosette-shaped, dry-climate perennials. The leaves are persistent, fleshy, organized in dense rosettes, often triangular, more or less wide, sometimes bordered with a purple border. They can also be hairy or covered with a waxy layer, which gives them a light blue hue. In spring, the echeverias form flowers at the end of long petioles emerging from axils of the leaves. In the spring, plant your potted echeveria in potting soil or decomposed compost mixed with sand, on a layer of non-calcareous gravel. Add a mulch of sand on the top of the soil, otherwise the basal leaves may rot. Place the echeveria in bright light. For echeverias planted in open ground, place them in full sun, in a very drained soil, rich in humus, or rock. Attention before planting outside, the echeverias freeze below 5 ° C.
Excessive watering causes rotting of the echeverias, as well as wetting the leaves during watering. If the rosette is too wide to water from above, soak the bottom of the root ball. In season, water twice a week, then slow down gradually to once a month in winter. Take out your potted echeveria for summer to give it light. Bring your potted echeveria at the end of the summer. During the winter, place it in a room around 16 ° C.
Mealybugs can attack your echeveria, as well as snails and slugs. If at the end of winter your echeveria bears too much damaged leaves, cut them delicately, and shorten the dry stems.